Store-bought chili sauce adds a dash of spicy to these sweet and simple spring rolls. Filling Blanche asparagus in boiling salted water until tender to the bite, to 5 minutes. Peel and julienne mango or papaya and ginger. Julienne bell pepper. Set aside with remaining filling ingredients. To assemble, fill a large bowl with hot water. Working with one wrapper at a time, slip rice paper wrapper into water until pliable, about 1 minute. Place wrapper on cutting board. 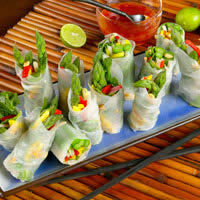 In the center, put 3 to 4 asparagus spears with the tips coming off the end of the wrapper slightly, 3 to 4 mango or papaya slices, 3-4 pepper slices, tablespoons sprouts, 2 tablespoons herbs, sprinkling of ginger and peanuts. Roll the wrapper from the bottom up, tightly. Leaving the ends open. Set aside and cover with a damp towel. Finish with remaining wrappers. When ready to serve, slice wrappers into 3 segments each and stand upright on a serving platter. SauceMix chili sauce and limejuice together. Serve along side the rolls as a dipping sauce.